“Polish the twofold spirit heart and mind, and sharpen the twofold gaze perception and sight”. Success in military operations is a product of good leadership, sound management and luck at different levels of command. A lapse in the command and control process can spell disaster, sometimes at the cost of lives. Incompetence in the AFP is no more common than in other organizations, but because of the very distinct nature of our job, it is more obvious and judgment is not always kind. These are just some of the reasons why individual commander are often identified with military disasters. However, the problem for the most part, beyond the commander’s control, as this article will suggest. This article is neither intended to be apologetic nor to accuse certain individuals. Surely, the AFP is never short of brilliant minds. Many of our officers are products of the finest schools and training programs. We even encourage our people to pursue higher education, at government’s expense. Yet at the end of the day, we have to ask ourselves why is it that we don’t seem to be making any progress, committing the same mistakes over and over again. The credibility of a country’s military power is an important factor in its ability to gain its objectives without the use of force. If the AFP is successful in operations, the options available to our enemy are limited. The reverse is also true if we have a record of failure and incompetence. We are actually putting ourselves into a position of greater risk by encouraging our enemies to continuously challenge our forces. This article intends to give an honest look at our organization, and what we can do to make AFP, an organization we can truly be proud of. And although the observant among us are quick to notice the incompetence in others, we fail to see it in ourselves. Richard A. Gabriel in his book defines military incompetence as the inability of military leaders and forces to avoid mistakes, which in the normal course of things, could and should be avoided. Of course, what Clausewitz calls “friction” and the “fogs of war” could never be totally overcome. Therefore planning only hopes to reduce these uncertainties. A conservative and tradition attitude. Marked by the misuse or rejection of newer technology and the inability to learn from experience. A determination to reject information, which challenges preconceptions. A tendency to overestimate the abilities of one’s own side and underestimate the enemy. A failure to make adequate reconnaissance. A preference for frontal assaults and brute force over surprise, deception or tactical skill. A belief in fate or bad luck rather than a rational assessment. Sounds familiar? Do not be overwhelmed, this only tells half the story. They are symptoms of the real disease. The fact that the errors occur again and again is due to the nature of our culture and values, training and doctrines, and the personality types of officers. The most obvious problem within the area of the AFP organization lies in training and education. According to Sigmund Freud, the competence and ability of a soldier is a product of how he was trained and educated. Since today’s Internal Security Operations is fought at the company and platoon level, most of our problems could be solved through doctrine and training. Doctrine is a set of fundamental principles that guide the actions of armed forces. These distilled insights guide the commander in determining the proper course of action. It is authoritative, but still requires judgment on the part of the commander. It’s good that our present thrust towards the doctrine development has become a priority. Unfortunately, we still have a long way to go. As of this writing, only 7 core manuals have yet been promulgated. Granting that we are still a few years away from completing our operational and tactical doctrines, the concept of fire and maneuver should be the bread and butter for all small unit leaders. This is basic. It has been taught to us over and over again but unfortunately, these are just concepts that remain in the minds of officers. Its practice is not extended to the battlefields. Why? Because our soldiers do not undergo unit training in fire and maneuver. In the battlefield, we win some; we lose some. Sometimes an M-60 gunner saves the day by maneuvering to a vantage position alone. We owe our success to the personal acts of bravery by our troops, not the proper application of military technique. Courage is good, but that’s not the way we want to win in the future. It’s rare to find a well-executed operation that’s anchored on teamwork. Unit training is a command responsibility. Soldiers who fight together should train together. Today, we tend to overlook unit training in favor of more immediate tactical concerns in the area. A quick look at the deployment of forces in the area will show that almost all of our battalions are deployed to contain a specified Areas of Responsibility. To pull out a battalion to undergo retraining, is to leave a vacuum that is hard to fill. We must realize that it is not always a good idea to deploy units over an extended period of time. Units, like individuals need time to recondition and train. Prioritizing training doesn’t necessarily mean we sacrifice operational concerns. In fact, by keeping our soldiers sharp and motivated, we minimize the risk of committing tactical mistakes once the shooting starts. However, if the opportunity to train does not present itself, there are other tools the commander may use at his level. The best way to keep your men organized in the heat of battle is to rehearse. Rehearsals, drills and briefings are absolute necessities that could mean the difference between the quick and the dead in any engagement. These are must-dos for a commander who truly cares for his men. Norman Dixon’s On the Psychology of Military Incompetence reveals the process by which armies make themselves the way they are and shows how difficult it is for armies to escape the worst effects of their own culture. The worst thing about our culture is that we are a product of a larger, more encompassing culture: the Filipino Culture. No matter how hard we try, we are still unable to escape the culture of parochialism, careerism and mediocrity. All of these are antithesis of professionalism. It is a known fact that there is a shift in the basic values among some AFP officers today. As Samuel P. Huntington observed in his work The Soldier and the State: The Theory and Politics of Civil-Military Relations, one of the salient characteristics that has traditionally distinguished the officer corps is its view of the military as a “‘higher calling’ in the service of society.” However, the attitude of self-sacrifice and commitment is slowly turning toward self-interest. Officers are the institutional memory of any unit. They are the living repository of its history, its experiences and above all, its lessons. Not too many officers stay long enough in a certain position for them to gain expertise in their job. Just when they are at the point where they have mastered the details of their work, they punch their ticket and move on to higher responsibilities. Whenever an officer puts his personal agenda over his mission, the effects are twofold. For the officer, he/she fails to absorb the finer points of his line of work. For an officer, not to be an expertise in his/her given field is to be an amateur. But it is even worse for the organization because we lose the ability to learn from our mistakes. At first it appears as if we recorded everything. But in reality, we learned nothing. It is this warped sense of values that have propagated mediocrity in the AFP. Officers and men alike must strive to attain levels of proficiency that will define a true professional over an amateur. Yet, there are still others who, despite all good intentions and training are ineffective in combat. One work of literature that helps explain why individual military leaders fail to perform is the ‘The Peter Principle’ by Dr Lawrence J Peter. This puts forward the view that in all hierarchies, employees tend to rise to their own levels of incompetence. If you are good at your job, chances are, you will at some stage gain promotion. This will keep on happening until you reach a level at which you cannot perform–your level of incompetence. At this stage promotion becomes impossible and you end up stuck at your own level of incompetence, since there is no mechanism to be demoted back down the hierarchy. Thus, over time the hierarchy, would be filled by people who have reached their level of incompetence. Of course, not everyone reaches this level at the same time. The corollary of the Peter Principle is therefore useful work in the hierarchy as accomplished by those officers who have not yet reached their level of incompetence. Performing well in one job may earn a promotion to a position the officer cannot handle. Clausewitz’ field marshal, like our brigade commanders, needed intuitive and thinking skills. He needed an intuitive grasp of the big picture. They have to perceive the overall situation through the fog of war. The regimental colonel, like our company commanders, needed sensation and feeling. They have to inspire their men in battle. Suppose a professional officer is strong in thinking and sensation, but not in feeling. He or she will succeed as a technical or special staff officer, but not as a commander or leader. This is the Peter Principle at work. The person rises to his or her “level of incompetence.” As in the book, On The Psychology of Military Incompetence, there are those captivated by leadership and those who lead naturally. The challenge, of course, is to find the natural leaders at the opportune moment, the men and women who possess intelligence beyond the classroom and who measure success according to achievement. Heart and mind are feeling and thinking. Sight is direct observation and perception is intuition. The words “polish” and “sharpen” are especially significant. Polishing and sharpening were vital operations in the care of the Japanese sword. The sword was the soul of the Japanese warrior. Musashi tells us how to polish and sharpen the sword of the intellect. This is the instrument of all victories. Again we go back to training and education. Indeed it will take some time to change the culture of the AFP. The most we can do is educate our officers, and the culture will naturally follow. Training and doctrine development is something we can do today. Unlike operations, the fruits of doctrine are not immediate. They will only be realized years from today. Given our impatient results-right-away nature, it is easy to understand why some of us do not understand its value. Training and doctrines is in fact, our number one antidote for incompetence. Today is my mom’s 67th birthday. 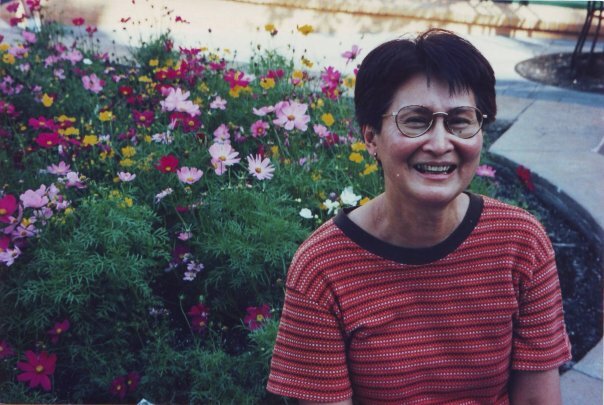 To remember her, I am posting her article for the Corps Mag, Femmes Issue in 1992. Happy Birthday Mom. We miss you. This is her soul captured in her own words…. When I was requested to write on what it is to be a PMA-Air Force wife, I hesitated, thinking about how I will expose my family’s very private life. On the other hand, the request to write my story came as my husband is about to wrap up his career, just as my eldest son is about to start his- It was also timed as my husband and I were about to celebrate our 21st wedding anniversary, and therefore I found it an occasion to reminisce, for indeed, I went through a full and exciting life as wife to a military man. Ours may have been a typical military family, but we can also claim that it had been uniquely ours. And so, I write my story for my husband with whom I lived through the lows and highs of assignments and promotions; for a son who is struggling it out in the Academy,; and for my daughters and other son who, like me , adjusted to a life dictated by the service. I did not plan to be a military wife. Coming from a very civilian family, I did not also know what would be in store for me. My husband courted me while he was schooling, and so, I did not see him in uniform, nor witnessed him on duty. But now and then, he would say he would be on flight and would be away. When he came back, it would be with some goodies and stories to tell about some parts of the country. When his schooling was about to end, he convinced me to marry him, no matter if it was such a brief getting to know you. But I was no Kaydet Girl, I had my own career, and already knew what I wanted in life. He too was well started in his military career – 4 years in the Academy, 2 years in flying school, then 8 years as a fighter pilot. He was also recently promoted to major. And so, we married, in the simplest manner we could think of – no printed invitations, no bridal entourage, no military uniforms, but we had our families and his classmates and their wives in attendance. Our only ninong was a retired PAF-CG, a kindly gentleman who initiated me to the military with a brutal military joke by asking my husband in my presence if I was the same woman my husband introduced previously. There was no introduction to the military life. It was normal that my husband’s job is a 24-hour a day, 7 days a week schedule. It could be breakfast as early as 4 am if a flight was scheduled at 5. It was staying overnight at the base (which was often) when he was on duty or when alert was called. Or he could be RON (rest overnight) somewhere on a flight assignment. At the time when the man in uniform was most unpopular, there he was in uniform; in the give away regulation haircut, when the long hair for men was then fashionable. But those were the superficials. Occasionally, flying accidents, or military operation related casualties involving classmates or known colleagues of his would happen. These were the harsh realities of his carreer. The service was the centerpiece of his life. Assignments alternated from field to office, from tent living to plush air-conditioning at the headquarters, from parajumping to combat flying, and then pencil pushing. He was not beneath eating from a coconut shell, but he enjoyed steak and papaitan as well. His career took him from a life at the flight line, to foot patrolling, from Sanga-Sanga to the deep dark forests of the Cordilleras. Yes, there were also trips abroad (with his family too). His assignments spanned from squadron to wing, division, PAFHQ, GHQ. The 30 plus years moved him from operations to planning, logistics to additional civilian and military schooling. And, on the twilight of his career, he has recently checked out from the MG520 and is back in operations once again. No, it was not limited to an Air Force career. It was an all around military career. I witnessed his frustrations that no matter how much the effort, he could not always get what he wanted; a system he painstakingly setup is immediately debunked by a successor; the battle in the headquarters is often times more bloody than out there. I stood by his successes (remaining credible and respectable). I lived through the unfolding of our country’s history, from the Marcos years to the present democracy. Those events affected our lives – my husband’s assignment in the south during the Mindanao Campaign; living through the period the military was misused and abused; going through those February days in 1986; experiencing the coups, knowing that my husband’s life was again and again on the line. A low point in his career is landing in the hospital breaking a leg during a parachute jump. (this happened twice). A challenging assignment is to be sent to a far flung island down south. But to head the most undisciplined unit and turn it to the snappiest proved to be the most rewarding of all. Recognition came in his promotion to star rank. And I can say with no boast that indeed he earned and deserved it. Although the military life was most alien to me, I thing I adjusted quite well to it. Thanks to the school run by German sisters who trained its students in simplicity, order and discipline. Thanks to my family who valued hard work, independence and privacy. For the military career is not financially rewarding, and therefore, if we have to live within our means, it is with the most prudent spending, simplicity of taste and controlled wants. And in order to grow intellectually, socially, I kept and worked on my own career. My life in the academe enabled me to keep in touch with the young and civilian society, broadened my scholarly interests, and in a personal note, is the source of warm and enduring friendships likewise tested by trials, successes and time. It also meant my financial independence and personal contribution to the family needs. And because I was occupied, I did not have time to lobby for my husband’s assignment, to indulge in petty military gossips or even to play a game of mahjong. For many years, I did my own driving for my children, for my husband and for myself. And even as my husband rose in rank, I still take the jeep, the bus and the LRT. But because of my husband’s job, I have had the out of the ordinary experiences. He has taken me to fly with him at the aircraft’s controls. I have seen exotic parts of the Philippines- Sanga-Sanga, Sibutu, Cagayan de Tawi-Tawi. I have been on boards a PCF (patrol craft fast) on a stormy occasion, when my feet would remain temporarily suspended as the PCF drops on the trough. I have taken lunch in the market in a small Bohol town, where even in my most rugged and dirty clothes, I still did not blend with the crowd. I have taken a bath in a cold river, with onlookers yet. I have experienced being stranded overnight in a military base with no extra clothes except that which I was wearing. And of course, I saw a lot of airports, aircrafts and a lot of Philippine skies thanks to the PAF. We do not expect our Dad to be present at family occasions- baptisms, first holy communions, birthdays, graduations. If he was home for Christmas, he would not be around for the New Year. But during the recent years, when he would have to stay in his unit for the holidays, my family would prepare the food, go to his unit, and share the goodies with those on duty. If he comes home before 7 in the evening, I would usually ask him why he is home so early, or, will he be going out for socials? One day when I was not around and he came home early, my daughter greeted him: “ Dad, why are you home so early?” –as though it was her role to take it over from me. Although his presence was not constant, he remained a very strong influence with the children. The military life was our way of life. Rules may be questioned, but they are to be complied with. Physical fitness, sports, are interests appreciated and honed. Keeping time is a must. Commitments are honored. It is in the military where I experienced a rich social life. My husband and I developed close friendships among other military couples with whom we stood by through thick or thin. Those we also appreciated were the men and civilian employees who at one time worked with my husband, but through the years, kept in touch, this time for friendship. There were those whom we preferred not to be associated, and so, they just come and go. The recent years found us playing host to our son’s friends from the Academy, whose families are in the south. My family is now paying off my husband’s social debts to all those families who also played hosts to him while he was a cadet, and far away from his own family. And as my husband rose in rank, there were opportunities to meet high government officials, foreign dignitaries, occasions to dine in Manila Hotel, and even invitations to Malacanang. But these are just icing to the cake that is a career of dedication, sacrifice and service. I suppose I was asked to write this article to enlighten some ladies out there on how it is to be married to a soldier. I will not disappoint them. I will give unsolicited advice too. It helps that one marries a dedicated, brave, and hard-working soldier, because not all Ayers are. It also helps that whom you marry is a one-woman man. Not all Ayers turn out to be one. And because you decided to marry a soldier, do not expect that you or your family will be his priority. Because he will be where the service requires him. Expect to do his share of tasks in the family because he will not always be there. Keep your own interests because the service does not welcome the wife’s involvement in the day-to-day military activities. Work because your soldier’s pay is not enough if you want good education for your children. Besides, your soldier is constantly exposed to life threats and you have to prepare for that eventuality. Keep your children together, raise them with good values, otherwise they will be called military brats. Maintain a simple life, otherwise people will wonder how you can afford a rich lifestyle on a soldier’s pay. Encourage your soldier to do well in his work. Do not block his assignment to far flung places or to dangerous units. Those are where promotion points and medals are earned. Encourage your soldier to maintain his physical fitness and snappy bearing so he will remain the handsome soldier of your lifetime. Do not ask questions not meant to be answered. Some aspects of his job require secrecy. Do not even wonder how many men he’s killed. He was trained to be a soldier, so leave it at that. Values, character, and leadership: They are all linked together. Allow me to explain. Character development is essential in leadership training. Actual leadership, good or bad is the offspring of the leader’s character. Therefore it is imperative that any leadership development program must be values driven, because it is through values education that development of Leaders of Character is possible. Leaders of Character are described to be people who seek to discover the truth, decide what is right, and demonstrate the courage to act accordingly, always. They are Conscientious Moral Agents who have the capacity for Transformational Leadership (Rachels, 2003). It can be said therefore that the quality of a leader’s character is dependent on his core values. If these values, together with the leader’s emotional, mental, and physical attributes constitute character, then they must also manifest it through competence and behavior. Transformational theory argues that leadership shapes, alters, and elevates the motives and values and goals of followers. Therefore, there are four basic elements that must be present for leadership to occur: a) the leader, b) the follower/s, c) the goal, and lastly, d) values. In the military, the doctrinal approach to developing leaders is focused on the development of traits; bearing, candor, tact, decisiveness, etc. This assumption is problematic in the sense that these traits are merely external manifestations of the leader’s values. Training military leaders must begin with accepting the notion that leadership and values must be developed together, not separately. So if value formation is a never-ending cycle, therefore leadership must also be viewed as a continuous work in progress that is nurtured through continued learning. And for as long as we never stop learning, our leadership/character development never stops growing. Having established the relationship between values, character and leadership, I subscribe to the Transformational Theory of leadership where leaders and followers raise one another to higher levels of motivation and morality. In order for me to become a Leader of Character, I have to continuously seek self- improvement. Hence, I consider my leadership as an open ended question, because before I can define it, I have to look into who I am as a person. Life is difficult. Accept it. Don’t complicate it further. Time can be a cruel taskmaster, or your servant. It‘s up to you. Humility and patience are the most difficult disciplines to acquire. They are also the most important. Define your non-negotiables. Know where to draw the line where your integrity in concerned. Lastly, great leaders inspire above all else. Be someone’s hero today. If the leader has wrong values to begin with, these traits will come out as inconsistent. To allude to Aristotle’s dictum “a single swallow does not a summer make”, neither does a single act of leadership make a good leader. When we talk of military education, it is often associated with the development of knowledge and skills in the performance of command and staff positions. What is often overlooked is attention to attitudinal development through moral growth. True enough,, if one reviews the objectives of AFP Command and General Staff College, the focus is on planning, executing, understanding and the application of skills. One asks: why isn’t there enough emphasis on moral development? Recently various observations have been made that the quality of AFP officers has tarnished over time. The alleged involvement of some officers in high profile scandals had cast serious doubt among the general population and within the AFP and on the effectiveness of PMA in producing competent leaders of character and honor. Among the most sensational of these controversies in recent memory include the corruption case of Major General Carlos Garcia, the Magdalo Mutiny, the alleged involvement of the senior AFP in election fraud and as of this writing, the involvement of former Chiefs of Staff in high profile corruption cases. The perception today is that the AFP has been wanting in producing leaders of character. In the inquest that follows every scandal that involves an AFP officer, some of the blame is understandably directed towards the AFP. So how exactly do we develop leaders of character through military education? Here are theories that suggest how. According to the U.S. Army leadership framework, leadership begins with what the leader must BE, the values, and attributes that shape a leader’s character. These are internal qualities that a leader is supposed to possess. Character helps the leader know what is right, and what motivates the leader; more than that, it serves as the linchpin that links knowledge into action. (The U.S. Army Leadership Field Manual FM 22-100 , 2004) It should be noted that it is the Emotional Attributes that help the leader make the right ethical choices. In Lawrence Kohlberg’s Stages of Moral Development, he explains that a person progresses from Individual, (preconventional) to Group (conventional) to Universal (post conventional), and it is only upon reaching the last stage that the person becomes a Leader of Character. At the Post Conventional stage, a person becomes capable of critical thinking, analyzing his motives and only acts once he validates for himself that he is doing the right thing. At this stage, the person is not acting out of reward or punishment (preconventional) or adherence to group or legal conventions (conventional), but instead, acting according to principles and values (postconventional). Participating in creating and maintaining a just community. 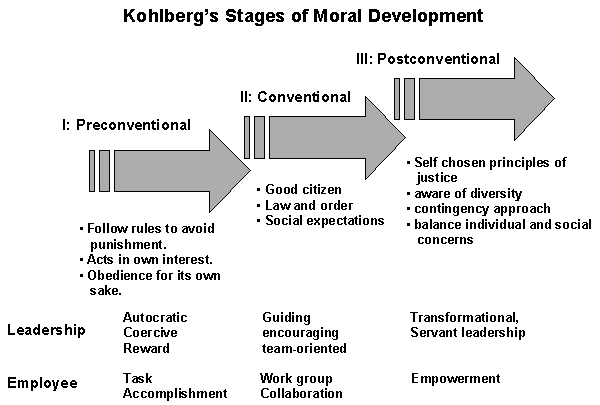 By reviewing Kohlberg’s model for moral development, a morally mature individual is one is what qualifies the Leader of Character. This person is characterized by self chosen principle, awareness of diversity, uses the contingency or transactional approach, and is capable of balancing individual and social concerns. From a leadership perspective, this person is a Conscientious Moral Agent with the capacity for transformational servant leadership. Hence, it can be understood that a Leader of Character is also a Conscientious Moral Agent. This also entails that Leaders of Character must have an evolved sense of moral reasoning, which may be mapped out through Kohlberg’s model for moral development. It is also stated in both concepts that the Leader of Character and Conscientious Moral Agent need to act upon their principles with conviction. Implied here is that competence is also necessary for character to manifest itself in the person’s behavior. Kohlberg’s study in particular is significant in the sense that it may explain why officers fail to internalize values given the current military education system. Many AFP officers fail to make the jump from conventional to the post-conventional stage of moral development. Thus, AFP officers are basically motivated by social approval and adherence to laws and social conventions rather than universal ethical principles. Ronald R Sims suggests several strategies for promoting ethical behavior in. First senior leaders in the AFP should encourage ethical consciousness in the institution from the top down showing the support and care about ethical practices. Second, our education and training institutions should be used to support and reinforce ethical behavior. For example, the AFPCGSC may involve the use of Core Values in the curriculum. Finally, it is recommended that the philosophies of the education and training institutions, as well as the faculty focus on the institutionalization of ethical norms and practices that are incorporated into all levels. The philosophies of AFPCGSC as well as instructors represent a critical organizational factor influencing the ethical behavior of their students. The faculty may also consider paying particular attention to principled organizational dissent. Principled organizational dissent is an important concept linking organizational culture to ethical behavior. (Sims, 1992) Principled organizational dissent is the effort by individuals in the organization to protest the status quo because of their objection on ethical grounds, to some practice or policy. Organizations committed to promoting an ethical climate should encourage principled organizational dissent instead of punishing such behavior. AFPCGSC should also provide more ethics training to strengthen their instructors’ personal ethical framework. That is, AFPCGSC must devote more resources to ethics training programs to help its faculty, and instructors clarify their ethical frameworks and practice self-discipline when making ethical decisions in difficult circumstances. One may argue that the values are generally already present in the curriculum. This means simply making explicit what is often implicit. Experience has been that the curriculum is full of opportunities to include values interventions, regardless of the subject being taught. Good instructors will be including some aspects of this in their work. The purpose of planning interventions is to make the values more explicit, where they are already implicit in the scheme of work, in lesson planning, and in the process of teaching. Teaching values is not necessarily about teaching about different things, but about teaching in a different way. Another thing to consider is that learning values cannot simply be learned through lectures. Since character development entails a transformation of values manifested in behavior, the normal lecture type instruction may be inadequate. The U.S. Army Leadership Field Manual FM 22-100 . (2004). Barger, W. (2002). Moral Language in Newspaper Commentary: A Kohlbergian Analysis . Goleman, B. &. (2002). Primal Leadership . Boston Mass: Harvard Business School Press. Rachels, J. (2003). The Elements of Moral Philosophy . McGraw-Hill College. Sims, R. R. (1992). The Challenge of Ethical Behavior in Organizations . Journal of Business Ethics. Leadership is an enduring theme in the military. It is the most important of all battlefield operating systems, and the central lynchpin that makes all the other systems work together. Almost everything a soldier does revolves around leadership, whether it is commanding a unit, training fresh recruits, serving as staff, or simply mentoring. Leadership is part and parcel of their daily lives. It is not surprising then that more than any organization, it is the military that invests time, effort, and resources training, and nurturing leaders. It is important to point out that military leadership is different from the kind practiced by the corporate world. Leadership within the military has often been associated with rigid discipline reinforced by a hierarchical organization. True enough, when one mentions the word “leader”, one thinks of the position, title, or rank. The officer’s rank carries with it the authority of law to lead, enforce regulations, and demand obedience over those to whom he is entrusted. Soldiers on the other hand, are required by regulations to follow orders without question. How they are motivated can stem from a variety of reasons. Some soldiers may not like it. They just have to do it. Discussions of military leadership are often hopelessly intertwined with issues of authority. Military leadership as we understand it can only exist because of the authority bestowed upon the leader. Without that authority, the paradigm is in trouble. Officers, who hold power over their men, have a tendency to overlook the fact that their followers have minds of their own. They may follow orders, but not necessarily share the vision of their commander. They may actually take up different values from the ones the military organization is trying to advocate. Some may argue, that the military organization makes up for it by looking after their morale and welfare. This may be in the form of recognition, medals, and additional pay. However, providing for the soldier’s basic needs is merely a transaction, which does not necessarily transform their values. Sometimes, the transaction itself may be an instrument of coercion by simply withholding it. At the end of the day, soldiers follow, simply because their leaders say so. Thus, it can be said that military leadership, despite being transactional, is still essentially coercive due to its reliance on authority, and thus fails to transform the values of their followers. So why is this important? Is it absolutely necessary to transform followers’ values given a military context? More importantly, why do we need to rethink the way leadership is practiced in the military? These are the questions this paper hopes to address. The writer shall approach the issue through inductive reasoning, beginning with introducing theories, a presentation of hypothesis, and application. For years, the military’s institutional memory has only allowed it to view leadership from within its own perspective. While this perspective is not necessarily wrong, it is also not everything. This paper will explore other viewpoints. Let us look at how perspectives of leadership developed through the years. The study of leaders and leadership began from the so-called “Great Man Theory” that opines that leadership is an innate ability. Leaders are thus, born, not made. In almost every culture, whether in myth, legend, or history, are accounts of great leaders who were divinely inspired. Men like Moses, Jesus Christ, King Arthur, and the Duke of Wellington were simply destined to lead. After World War II, the Trait Theory was introduced. It says that leaders must have traits for people to admire and recognized as “born leaders”. The trait perspective argues that leaders could be made but only if they have in-born potential. Which is not much different from the Great man Theory. In the 1950s, the Behavioral Theory emerged. It departed from the trait perspective, and delved into the key behavioral patterns that result in leadership. Popular studies focused on two particular behaviors: consideration for subordinates, and initiating structure and discipline. Research conducted among corporate entities showed that employee centered leaders are more popular, but performance was often higher with a job-centered leader. Another theory was the Transactional Approach, or the Contingency Theory. Here, leaders are said to be more effective if they recognize what followers want. Thus, there is a tacit understanding between leader and follower: an exchange of rewards. Transactional leadership occurs when one person takes the initiative in making contact with others for the purpose of an exchange of valued things. Then, in the 80’s, the Transformational Theory of leadership emerged. Transformational leadership is said to occur when one or more persons engage with others in such a way that leaders and followers raise one another to higher levels of motivation and morality. The transformational leader has transformed followers into more highly motivated followers who provide extra effort to perform beyond expectations of leader and follower. It changes some of those who follow into people whom others may follow later. It also changes leaders into moral agents. Thus, emerged the link that connects value formation with leadership. From these different paradigms emerge different definitions of leadership. The Great Man, and Trait theories define leadership as an attribute, which the leader must already possess. Transactional theory views leadership as an exchange based on power relations requiring bargaining, trading, and compromising between leaders and followers. Taken all together, leadership is basically, defined as influencing others towards the attainment of a goal. Lastly, the transformational theory argues that leadership shapes, alters, and elevates the motives and values and goals of followers. Therefore, there are four basic elements that must be present for leadership to occur: a) the leader, b) the follower/s, c) the goal, and lastly, d) values. How do we characterize military leadership given these paradigms? The doctrinal approach to developing military leaders closely bears a resemblance to the aforementioned trait theory. A young lieutenant will most likely be given a checklist of leadership traits and principles, which he must memorize because they are designed to make him a good leader. By the time he is clothed with authority, he is expected to do great things. This assumption is problematic in the sense that these traits are merely external manifestations of the leader’s values. If the leader has wrong values to begin with, these traits will come out as inconsistent. To allude to Aristotle’s dictum “a single swallow does not a summer make”, neither does a single act of leadership make a good leader. Developing leaders without values is like a two edged sword. You have an equal chance of getting a villain for every hero. Without values, it could be argued that Hitler, and Pol Pot were “good” leaders. When we talk of values, we refer to the accumulated experiences of the individual, which can only be observed through the summation of a person’s behavior. The trait theory merely serves the purpose in identifying these behavioral patterns. Therefore, developing leaders into conscientious moral agents must begin with developing values. But can these values be developed? Surely it can, but the process is one of continuing development throughout the individual’s lifetime. Training military leaders must begin with accepting the notion that leadership and values must be developed together, not separately. So if value formation is a continuing cycle, therefore leadership must also be viewed as a work in progress that is nurtured through continued learning. Authority, or the lack of it defines the boundaries of how a leader should act. It is dangerous for a leader to overstep one’s authority to the point of losing control. It is also equally dangerous to make authority the sole basis for leadership, because in the long run, we are dealing with followers who nurture different value systems. Are we implying that we abandon our reliance on legal authority? No. As stated earlier, the coercive, authoritarian leadership practiced in the military has its purpose. This approach enables the organization to act decisively given a crisis. In like manner, there are constraints of time that will simply not allow a leader the luxury of convincing their followers. It just so happens however, that transformational leadership, even when the opportunity presents itself is often overlooked due to the leaders’ sole reliance on legal authority. It should be added that transformational leadership could only happen, if the leaders themselves have an acute sense of values that have been developed over time.